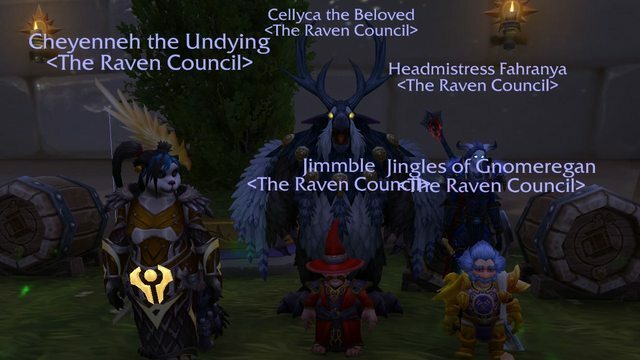 With their experience and talents the Raven Council will reach into new heights. Fahranya has shown endless patience and ability to lead during his years of organizing RG2 raids, and hopefully he will continue to do so for a long time. Cheyenneh will be responsible for organizing guild events, helping out with raid attendance and loot, taking care of consumables like flasks and feasts, monitoring guild repairs, keeping the guild vault in order, sorting out new applications, enforcing order on the guild chat and lending a helping hand to anyone in need. And Jingles has a wide collection of classic and hard rock albums. He is also a gnome. See you all on the next meeting! Fahranya leads raids, jingles has a lot of music, and ehm is there anything I am not gonna do? Nikki wrote: Fahranya leads raids, jingles has a lot of music, and ehm is there anything I am not gonna do?